Spring is on it's way, and Starbucks is celebrating with a new, cherry blossom-inspired pink drink. Cherry Blossoms are in season in Japan right now, so the Sakura Blossom drink “honors the season with flavors from traditional Japanese ingredients.” Plus, they're served in “special pink-cherry blossom cups,” they explain. 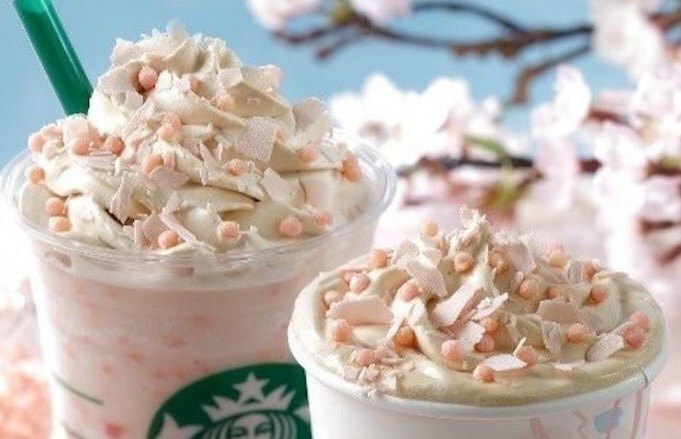 The cherry blossom petals decorate the cups that accompany this drink, and you can get it as a latte or as frappuccino. Whether you like it hot or cold, this drink is sure to please your taste buds with a Sakura sauce (cherry petals, condensed milk and white bean paste) and topped with shaved pink chocolate and pink rice crackers dusted over maple whipped cream. Sadly, it's only available in Japan, but we can admire it's beauty from afar.